I'm really having fun with the Eagles and all the Space: 1999 stuff. While the repaints still have a long way to go for the command module, the body is almost complete. 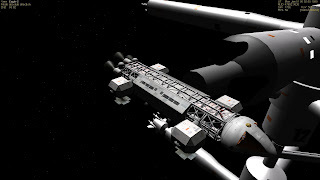 Following discussions on Orbit Hangar Forum, I'm also building a dedicates solar system configuration for the Space:1999 world. This way I can integrate better the available addons and create some interesting scenarios. - Two periods of Moon exploration. 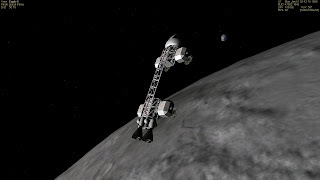 A pre-1990's where I only have the Spacedock in Moon orbit and a single "first stone" pad of Moon Base Alpha. 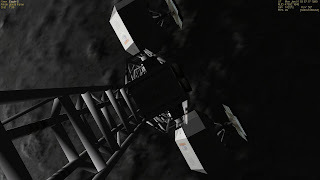 Following the series time-line and universe, the Moon is used for Nuclear waste storage. 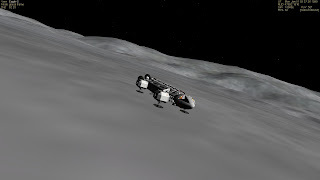 So missions of this early period will feature exploring the Moon surface to identify suitable sites for landing (flat, no high mountains, low altitude, etc.) and placing structures (waste storage). The latter period has Alpha completely built and at least one Nuclear waste disposal area. I might add the Mars base and a few interplanetary vehicles seen on the series and already available. The early period is fun because the surface exploration is being done in Orbiter. I'm creating the start situations and flying them, saving my progress along the way. I don't know exactly what will come out of this or what type of release I might do in the future, but its been very very fun do to. 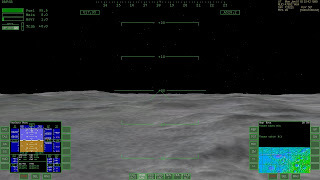 a) Low altitude close inspection of the lunar surface. b) Identify a suitable location to place waste disposal areas. 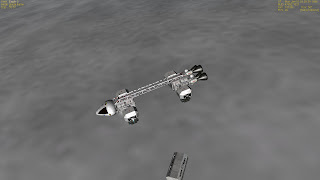 c) Land on the chosen area and detach the passenger module (modified for unmanned autonomous survey) to perform long term dedicated studies of the selected location. d) Liftoff and land on Moonbase Alpha. This looks like a smooth place ahead, let's land there! 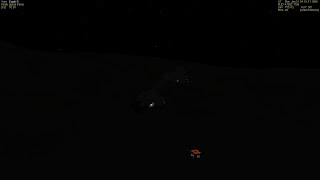 Descending to the surface for a manual landing. Landed! 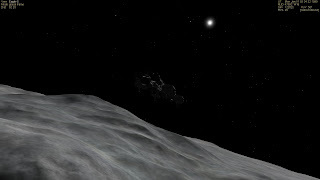 It's a nice scenic view, but we are in a hurry, so let's leave the pod and head to Alpha. It's night at Alpha's location, so we use LOLA to perform and automated liftoff and landing, due to lack of visual reference. As we are landed on a nice flat area, there's no problem of crashing into mountains at lift off. 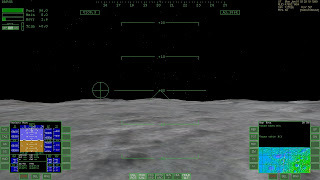 Enroute we enjoy a nice view of Earth and the lunar surface near the terminator. All went well and we landed on Alpha! Only the pad is built at this early stage, but the base will be built over the next few years. 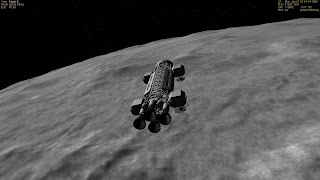 This first mission took only about 2hours to complete, as the Eagle is a very very fast spacecraft! 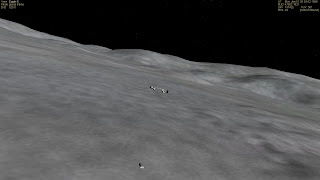 The landing took place in crater Compton at Lat 55.3º Lon 103.8º.